Can Specialty Pharmacies Ease the Pain Of Soaring Deductibles? The growing move among employers to adopt high-deductible health plans is one of the major “trends that matter” to specialty pharmacy in today’s stormy health care environment, according to Myrtle Potter, a health care consultant and former Big Pharma executive who offered some tips for navigating this challenge at the 2014 Armada Specialty Pharmacy Summit. In 2013, Ms. Potter noted, 17% of employers offered high-deductible health plans as their employees’ only option—up 31% from 2012, according to PricewaterhouseCoopers’ “Behind the Numbers 2014.” For 2014, she said, some 44% of employers were considering such a move (http://pwc.to/​1eRYLxr). High-deductible plans can pose challenges for anyone with a chronic condition, but they are particularly problematic for patients taking expensive specialty medications, with annual minimum deductibles of $1,250 per person and $2,500 per family. The 2014 annual cap on out-of-pocket costs is $6,350 for an individual and $12,700 for a family—high for anyone, but harder to swallow if it’s front-loaded into the first month or two of each year because of costly specialty drugs. Those steep costs can be a powerful trigger for noncompliance. In one study, high-deductible health plans were found to reduce adherence to prescription medication regimens in four of five conditions evaluated: hypertension, dyslipidemia, diabetes and depression (Am J Managed Care 2013;19:e400-e407), Ms. Potter noted. Only in asthma/chronic obstructive pulmonary disease was there not a significant decline in adherence. The conditions included in the compliance study generally do not require specialty medications, Ms. Potter pointed out; it’s thus possible that the documented adherence problems might be even more pronounced when it comes to specialty medications, “particularly because few of these drugs have generic alternatives in a lower tier, and patients may have to pay $7,600 or more per year out of pocket for specialty medications,” she said. If employer-sponsored plans are increasingly moving toward high deductibles, many plans on the new health insurance exchanges—especially at the lower bronze “metal level”—are already there. 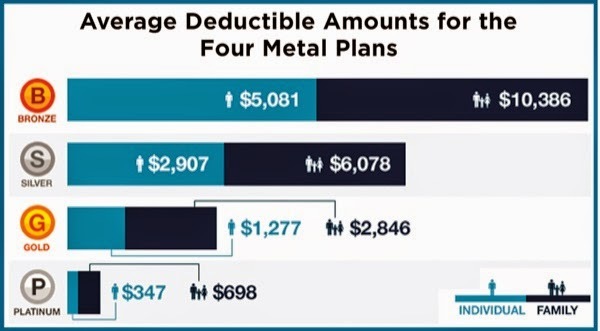 In December, HealthPocket Inc., which compares health insurance plans for consumers, found that the average annual individual deductible for a bronze plan was just over $5,000, in addition to the average premium of $295.51 a month, or $3,546 a year (http://bit.ly/​1oevFqq). It’s a patchwork solution that likely is not sustainable in the long term. “In the short term, we feel we owe this to our patients. As a nonprofit, health-system–based specialty pharmacy, providing this kind of high-touch financial assistance is one of our differentiators.